When your family won't turn up, try some tricky searches. How many times have you searched for your relative in a set of documents and found nothing? Or maybe you found a ton of results that looked like junk to you. There's a good chance that the search results are bad because the transcription was bad. Did the volunteer transcriber have trouble reading the bad handwriting? Did they enter dramatically wrong data into the system? Your search is doomed to fail, right? Not necessarily. If you use partial searches, related searches and detailed searches, you may find your family. It was common for our ancestors to have a first name and a middle name. But how were they identified on the census form? Did the person providing the information know them by their middle name only? Or by an adopted name in their new country? Try leaving their first name out of your search completely. Fill in their age and place of birth, but use only their last name. Try the opposite, too. I had more luck finding my grandfather on a census with only his first name of Adam. The census-taker wrote his last name in a way I hadn't expected. Simplify your search. Toss out the extras, and your results may improve. When a family is tough to find, look at the kids. The particular combination of children's names in this family can be the key to finding them. Do a search that includes all the kids' names. Leave off the last name and let the search focus on finding those kids together. You can also try using the husband and wife's first names only. That combination may be what does the job. I'm having trouble finding my great grandfather's naturalization papers. His name often causes me problems. 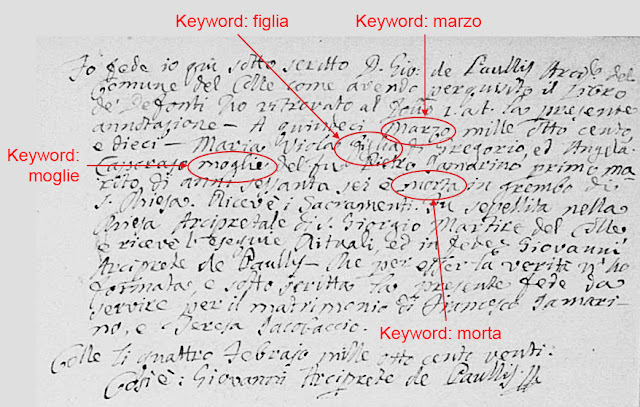 His given name was Pasquale Iamarino, but on some documents he is Patsy Marino. Or a combination of those names. So I searched using his exact birth date. I didn't find him. I also searched using his birth year and town of birth, but no name. His naturalization isn't showing up yet. But, I once found his wife's brothers on ship manifests by searching for their last name and town of birth only. 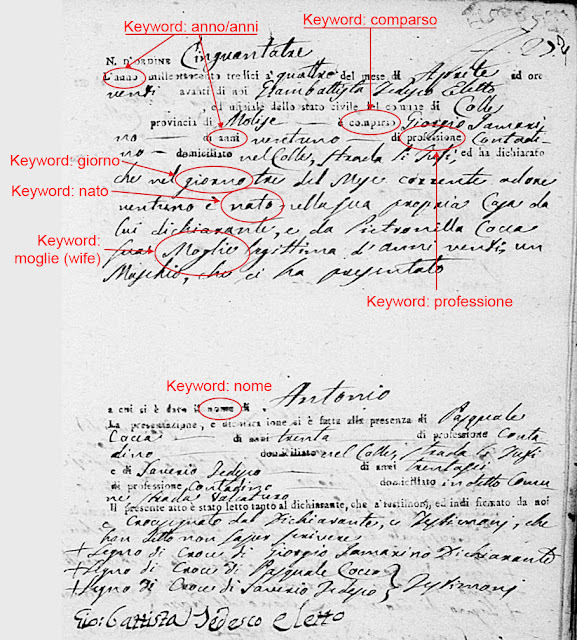 Here's an example using Pasquale Iamarino. I did a general search of all categories on Ancestry.com. I entered only his last name, his town of origin and his exact year of birth. The results were terrific. In fact, they include one new result that I never expected to find. It's the claim ID for his railroad retirement pension. I'll have to buy a copy of it from the National Archives at Atlanta (why there? ), but this is brand new information. So many misspellings, but the results are all for my great grandfather. My dad says Pasquale may have had black lung disease from years of cleaning out the furnace of coal-burning train engines. He had to retire early on disability. This pension claim may tell me a lot more about what happened to him. Also, the Suggested Records in the right column of my Ancestry.com results are very impressive! Despite all the spelling variations, that exact birth year seems to have done wonders for my search. All those records belong to my great grandfather. The point is to experiment. Don't give up if the results don't look promising. 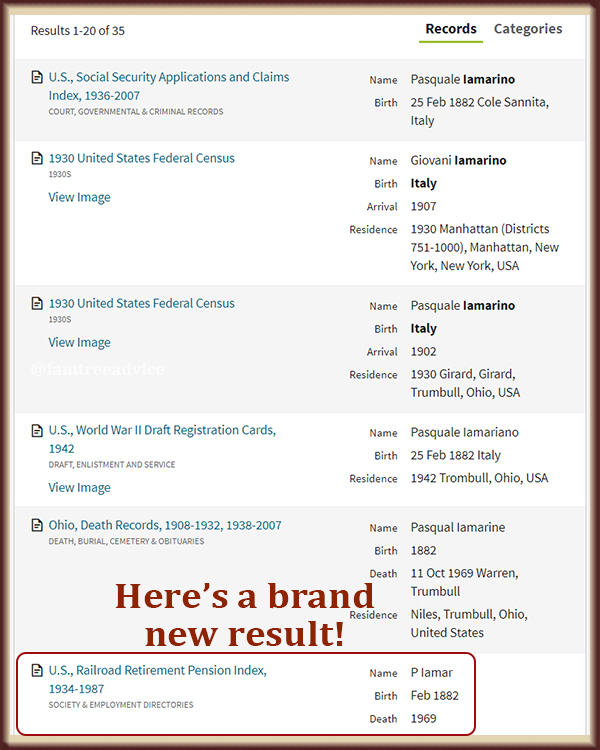 All these genealogical records are a gigantic database. You may need to slice and dice that database to get past bad transcriptions and misspellings. Give it a try the very next time you don't get the results you want. 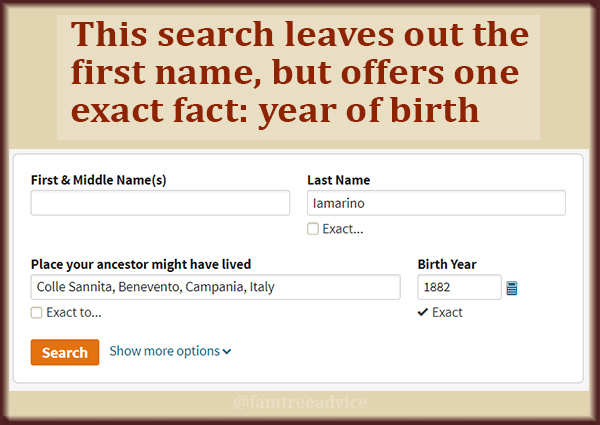 Do a partial search, add in related names, or toss out the names and plug in specific facts. Working on your family tree is a big puzzle. Clever searches are yet another piece of the puzzle. Don't get frustrated. Get clever. You may have started dabbling in genealogy years ago or months ago. Think back to the first documents you found for your family. What was the toughest hurdle for you? For most people, it's the handwriting—and for some of us, the handwriting in a foreign language. Do not let that slow you down! Every day I see people requesting document translations in Facebook genealogy groups. And there are always people ready to jump in to help. I'm one of them. But we don't type out the translation because we're fluent in the other language. Or because we were raised to read and write in an old-fashioned style. No. We can read and understand these birth, marriage and death records, census forms, ship manifests and more because we swim in them every day. I've written articles about understanding foreign-language documents before. You'll find them at the bottom of this article. Much like "The Blues Brothers", I'm "on a mission from God." My mission: To throw you into the old-fashioned and foreign handwriting water and show you that you can swim! Ten years ago this document was a ball of confusion. No it's all painfully obvious to me. A few days ago I realized the power of the immersion technique. I was hunting through some very old email I'd saved, trying to find the source document for some people in my tree. In a 10-year-old email, I found an 1886 parish marriage document for someone with my maiden name. My reply to the email surprised me. I asked my friend, "Why are there so many names on this document? What does it all mean? Who are they all?" As I look at the document now, it's perfectly obvious who they all are. They are the groom and his parents, the bride and her parents, and the witnesses. Why was I confused by that? The answer is simple. 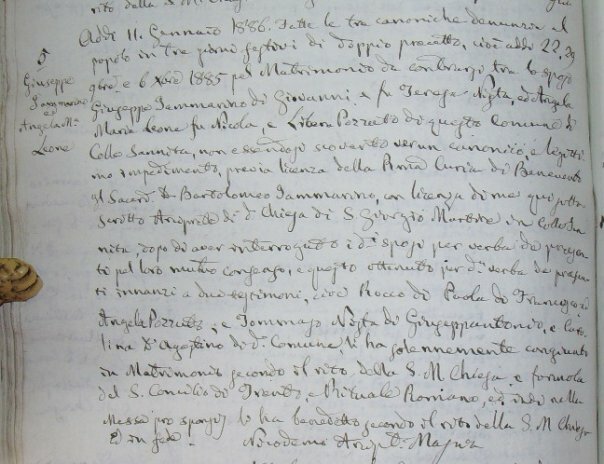 Ten years ago I hadn't seen any 19th-century Italian marriage documents. Now I've viewed and transcribed thousands of them. Below are 4 articles with links to resources for helping you understand those old documents. The single best technique for reading old genealogy documents is to expose yourself to lots and lots of them. Looking for your 2nd great grandmother's birth record? Look at the other documents before and after hers. Use them to help you figure out that one word or letter you cannot decipher. You'll also see for yourself which names are common in the town. After you see it written 10 times, that difficult last name becomes so easy to pick out. The obstacle of foreign languages and old-fashioned handwriting will disappear. Use the tools available to you. Spend time looking closely at similar documents. Familiarity is your best teacher. You can do this! Imagine you're searching through a collection of old, hand-written vital records. You're winding through a reel of microfilm or clicking through a collection of images. At last you find what you want: the marriage record for your 2nd great grandparents. Eureka! 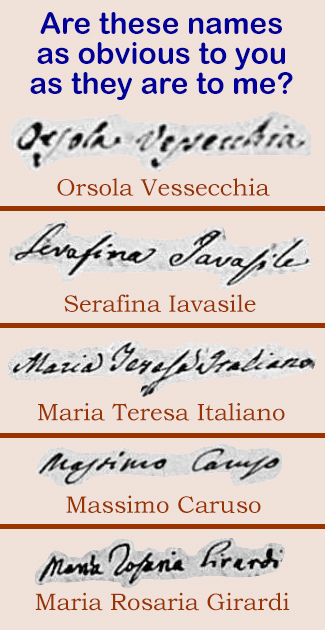 Now you can learn the names of two sets of your 3rd great grandparents. You grab a magnifying glass or zoom in on the document, eager to see those new names. But what do they say? They're almost completely illegible. You aren't sure of any of the letters! What would you do? I've seen people share an image on Facebook, asking for opinions on a hard-to-read name. Time and again, the people who can read the name with authority are already familiar with the exact name. That's the answer! I've been documenting vital records from all my ancestral hometowns for years. I'm pretty fast at it. Why? Because this practice helps me decipher even the most sloppily written names in no time. Scientists say we're able to read by recognizing the shapes of words. That's why it's easier to read this THAN IT IS TO READ THIS. And bonus! If you're examining a small town, there was no doubt a lot of intermarrying. You may find you're related to the majority of the town! So it's worth your while to learn those names. This image shows some examples of names that didn't slow me down for a second—once I made myself familiar with the town.